Girl scouts Start selling Dulce De Leche Cookies in 2008, inspired by the flavors of the famous Latin American alfajor cookie. 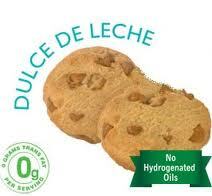 There are 160 calories in a 4 cookies serving of Girl Scout Cookies Dulce de Leche Caramel Cookies. These cookies are one of the most delicious variation of the Girl Scout cookies roster of tempting and healthy alternative snacks. 2. Place foil cupcake liners in muffin tin. 3. 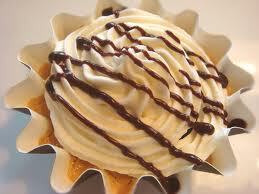 Place one whole Dulce de Leche cookie in the bottom of each cupcake liner. 4. Beat cream cheese and sugar. 5. Add eggs and beat until well mixed. 6. Add dulce de leche syrup, beat well. 7. Place ¼ cup of batter on top of the cookie in each cupcake liner. 8. Drizzle a swirl of dulce de leche syrup on top of each one. 9. Bake at 375° for 15 to 18 minutes, until set. Top each mini cheesecake with some Dulce de Leche cookie crumbles. corner off the baggie and then dispense topping from the hole. Ingredients: Enriched flour (wheat flour, niacin, reduced iron, thiamin mononitrate [vitamin B1], riboflavin [vitamin B2], folic acid), soybean and palm oil, dulce de leche flavored drops (sugar, palm kernel and palm oil, anhydrous dextrose, nonfat dry milk solids, reduced mineral whey powder, cocoa butter, yellow #5 lake, yellow #6 lake, blue #2 lake, soy lecithin, natural and artificial flavor, salt), sugar, brown sugar, contains two percent or less of high fructose corn syrup, natural and artificial caramel flavor, salt, natural and artificial flavor, cinnamon, baking soda, whey protein concentrate. Dietary Exchange: 1 carbohydrate, 1? Fat.